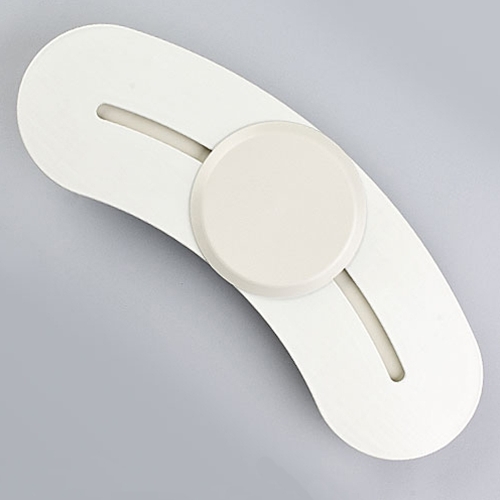 BeasyGlyder Transfer Board from HealthyKin.com is used to curve around wheelchairs with non-movable armrests. It also facilitates caregiver's natural transfer motions. The seat and base are same diameter. The design of the BeasyTrans Easy Transfer Systems make it possible to apply sliding technology to a wide range of transfer and therapeutic functions in both the clinical and homecare environment. It provides users with a safe, comfortable and dignified way to transfer from bed to wheelchair, from wheelchair to commode or shower seat, to a car and back again. The circular seat gliding on a track that supports the user's weight – up to 400 lbs. – also eliminates skin friction. BeasyTrans Transfer Systems are totally portable and most users are able to get in and out of an automobile. For some, this may mean a greater quality of life – being able to visit friends and family or attending educational and cultural events. The systems may even allow the user to live at home while receiving outpatient care, rather than living in a long-term facility. Because the seat easily rotates 360 degrees, the systems it can also be used for range of motion exercises for hands, feet or other body parts. Made of polymers the BeasyTrans is virtually maintenance free. When needed use warm water and soap to clean and wipe dry. Regular use of a disinfectant is recommended. BeasyTrans and Beasy II systems are easily disassembled for cleaning by removing the trackguard and unscrewing the nut securing the seat to the bases. Did everything advertised and offers a much smoother transition than other boards. Definitely worth the extra money. This board is ideal for transfer from wheelchair to CRV safely and efficiently for a quadruple amputee. It is a great board to transfer, but the only problem is that it is heavy and has weight to it. Especially when you have rotator cuff tears in your shoulders, and have weak arms and wrist. BUT IT DOES MAKE NO LIFTING EASY. Bought BeasyGlyder for wife who is in rehab after leg surgery. It has helped greatly in all her transfers. She was not making much progress until we got this transfer board. I love the Glyder board! It’s worth it’s weight in gold to me. Transferring my 91 yr. old non mobile mother to and from the bed, wheelchair, and chair is easy. Just practice first! This board is not as easy to get her from the wheelchair to the car, but we’ve done it with two people to assist. The longer board would be better I’m sure for the car. I would like to have it too. works as it says,makes transfers much easier. Helping my husband to transfer, good product.